I admit that my capacity to dilly-dally before actually posting an article (if at all) is quite impressive. But in this case, I am allowing an aberration. And I have a sound reason to do that. If this post saves the life of even a single phone, the effort will be worthwhile. We all have our own phone stories. Quite often, more than one. Okay, another thing – Gunjan almost worships electronic gadgets. I love them too – we all do – but he is really, really devoted to them. I contemplated not telling him about it as I suspected that he might seek to initiate criminal proceedings against me. But my conscience didn’t allow me keep mum because I owed at least that much to my Nexus 4. It needed to be attended to. And quickly so. And by the right person. Not by someone who could have been so careless as to let it soak in water! So, mustering all my courage, I broke the devastating news to him. I can’t describe what he went through. He was positively distraught. And I was not wrong about the criminal proceedings. He was looking daggers at me, feeling totally betrayed by such alarming irreverence. And I, with the guilt of my heinous crime weighing me down, held my head low and stared numbly at my phone. And about the braveheart – prima facie, my phone looked just fine. The touch worked as beautifully as ever. The display was as perfect as it comes. But we still weren’t too hopeful. Neither would you be if your Nexus 4 was leaking from every little port! 🙁 And then came the blow. Gunjan tried to play ‘Payphone ‘ (no pun intended – we were totally not in the mood 🙁 ) using PowerAmp but it seemed that ‘Maroon 5 ‘ had lost their voice! Dejected, Gunjan declared that the bucket of water had rendered the gadget as useless as a bottomless bucket.
. It’s nothing short of a violation. But then, you don’t even drop it in a bucket of water! So after bringing it apart, Gunjan used my hair dryer and tried to dry out every nook and cranny in the panel. Meanwhile, the guilt-ridden me (besides appealing to every God up there) was googling like crazy and going bonkers reading forums. Do you wanna know why? Because I thought it was some kind of a freaking joke. 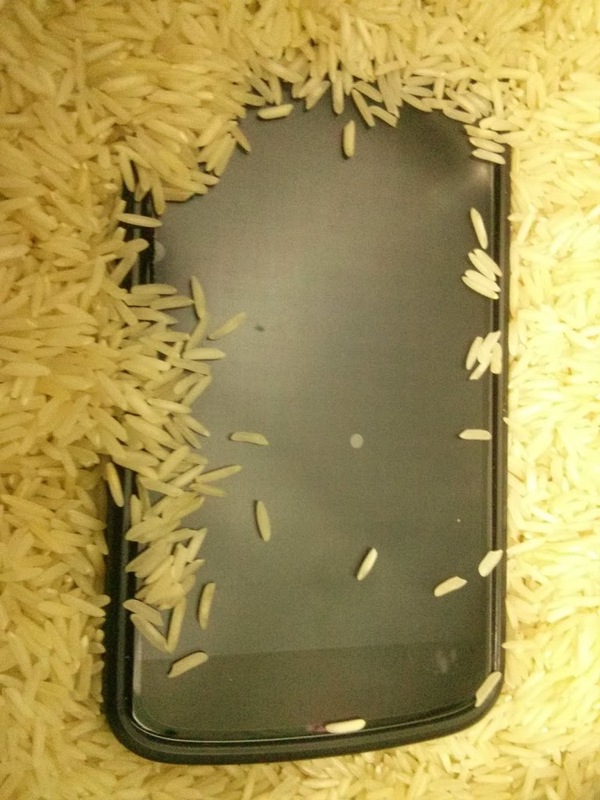 People had suggested to bury the phone in a bag of rice!!! Yes, you heard it right! I thought that in their grief, other unfortunate Nexus-drowning fellows like me had lost their thinking faculties. But I cannot deny that the success stories on the forums kept my dawdling hope just alive. After drying the panel as best as he could, Gunjan switched on the poor thing. Unable to accept the outrageous treatment meted out to it, the phone continued to act deaf and dumb and ignore all our fervent pleas. If I called on my number, all it did was feebly croon “Glad You Came” and that’s it. You could scream your lungs into the mic after receiving the call but the other person on the line wouldn’t hear a thing. Neither could you. And if you switched on the speaker, wildly distressing noises forced you to end the call. Having tried out every trick in the book and devoid of all hope, Gunjan and I (so not united in grief – he was still contemplating suing me) joined the loony group and turned to the mysterious box of rice. Normally, he won’t let me keep a grain of rice on Nexus but today, we both dug in the pile, placed the violated device in the dent, covered it with rice and then closed the box. I can’t tell you how disturbingly similar the rice burial ceremony seemed to a final goodbye. In a stupor, we went to sleep. There was nothing left to do but wait. Morning came and we rushed to exhume my phone. After retrieving it from it’s purported rice grave, Gunjan put the SIM card back in the slot. Mercifully, the panel was parch dry and there weren’t any signs of seepage. He switched it on and it looked just fine. Then, with fluttering hearts, we played ‘Payphone’ again and trust me when I say this, even ‘Maroon 5’ couldn’t be as happy hearing their own song as we were. The crystal clear sound resounded in our room, announcing the restoration of the speakers. Yes, the life-infusing white grains did the trick! Believe it or not, rice worked like a charm! It worked as a desiccant and healed my ailing, weeping phone. And my Google Nexus 4 is up and alive again! Bless you Google for making such a beautiful and resilient cell! Overnight, my love for the phone has increased exponentially! Okay, kindly spare some time because it’s gonna be a little lengthy. Gunjan and I took our first Europe trip together to Italy this March to celebrate our ‘primo anniversario’ and it turned out to be the perfect grand finale for the very first year of our marriage! Though we had to postpone the anniversary celebration by a week because of a work assignment I had in Germany (about which I hope to cover in another post), the love sickness that we suffered got compensated for in good measure with all the wild fun in Italy!! 🙂 If you know what you’re looking for and how to go about it, it’s a lot of fun to plan your very own trip customized just for you than to rely on travel agents to do so. Apart from being a means of sharing and treasuring our dream trip, I would be really glad if this post could help my friends in any way in planning their special trip and so I’m gonna try to be systematic about the whole thing. Weather: It was quite wet and chilly most of the times. That didn’t really play spoilsport because we were well equipped with umbrellas, jackets. scarves, gloves etc. We would generally visit one of the beautiful churches in the morning, plead and beg for a sunny day and get one for ourselves! 🙂 This only failed us once in Florence when the rain and the wind seemed hellbent to lock us indoors. But then we took a half day round trip to Pisa which made our day! Just try not to visit Italy when it’s very hot – from what I hear, the heat there incapacitates you. I was quite surprised to find that cards are not accepted at MANY eateries, shops, ticket counters etc. in Italy. So you need to carry some cash with you at all times. Sounds quite straightforward, right? Now here’s the catch: the country is teeming with pickpockets and con-men and you have to be very alert AT ALL TIMES, especially while using public transports. Such a beautiful and culturally rich country shouldn’t be discredited with this but I guess that’s Italy’s baggage! 🙁 I could have been milder about this if I hadn’t lost about hundred euros, two debit cards, my driving license, PAN card and a precious picture of Gunjan and me to a gang of scheming, thieving girls in Milan’s metro. Residing in Italy, these skilled crooks are quite familiar with all of Machiavelli’s Principles and are experts at stalling tourists, creating distractions, faking misery etc.! The country is plagued by many immigrants/unemployed people who are always on the lookout to earn a stray euro or two by tying a ‘blessed’ thread on your wrist or by playing the good Samaritan and pointing you to your hotel (when you’re already there) or by helping you with the ticket machine (which you have no problem whatsoever in operating on your own!). I don’t want this to be a demotivator – just the ‘better safe than sorry’ approach! Yes, ATMs are readily available. If you’re using a traveler’s card, no worries. If you’re using your International card, you might want to check the exchange rates, transaction fees and service charges. Trains: We made prior bookings using Trenitalia to commute between cities. The rides are short, scenic (especially the Tuscany region) and reasonably priced. Expensive Leaks: Okay, I realize the crassness of this heading and so I am gonna keep it very short! Just so you know, using washrooms is a costly affair in Europe. You will be required to cough up a euro (sometimes more) for every visit and so you might want to use public restrooms available in restaurants (if you eat there), trains and at the sites you visit. Packing for the Trip: Well, this will obviously be governed by the season in which you’re planning your trip but the rule of thumb is to travel as light as possible. I personally feel that the happy phrase ‘backpacking in Europe’ has an underlying message which we tend to overlook: Pack just what you ‘will need’ and give a miss to the paraphernalia that you ‘might need’. Escalators and conveyor belts are absent/amiss at certain stations and hauling the trolleys up and down the flights of stairs can be quite a task, more so if you’re running late. Language: People involved in the tourism business generally speak passable (sometimes good) English but Italian is what you hear from others. Getting around is not really an issue but it will certainly help if you mug up a few Italian words and phrases. Chicken based recipes are not very common, though. Also, as a fall back option, you might want to locate a restaurant of your choice near your hotel. On certain days, we didn’t mind savoring ‘paranthas’ and ‘aloo-gobhi’ at the Shanti restaurant in Rome! Public Transports: In all the major cities, there is a very good network of metros and buses. Well, trams too are available but they are slower. Try getting hold of a route map to help you get around. Spend a few minutes to figure out the connectivity and it will save you a whole lot of confusion later. Also, the hotel staff can guide you very well on the sightseeing stuff. So you know what next to save for, right? Totally worth it – because it’s gonna stay with you forever! An experience of a life time + bountiful of merry time! And yes, please don’t hesitate to post any questions that you might have. I guess it’s kind of an achievement for me to post something before celebrating an anniversary of my last post. Fell short by just two months..huh!! Though he’s been hanging around here, heaping amazingly biased praises and egging me on since the inception of this blog, yet, let me just introduce my Mr. Right here formally! This post is about my first-hand experience at full-fledged driving and the ensuing intellections. You see, earlier, I always considered the driver and the car to be a single entity. You know, like a package, two-in-one sorts. It makes me look so mean but I can’t distinctly recall having ever given much thought to the ordeal a driver faces while manoeuvring and motoring his harassed vehicle through the on-road mayhem. It always felt like the invisible thestrals are drawing our automated carts. My sis and I used to go shopping with our driver and oh, how we drove him crazy! We would screech excitedly if we spotted something interesting and no matter what be the traffic conditions, we would plead and beg for him to let us out. The combination of being so sweet and such a pro at the same time proved quite troublesome for our poor driver. 1) You tell me the right turn at least two turns before or else I don’t turn at all. 2) You announce the way well in advance or get ready to receive an earful. 3) Air condition usage – my discretion (You’re not the one who has to worry about the pick-up and stuff!). 6) Parking – No, I don’t have the heart to talk about this one. Just know this that it was the Achilles’ heel of my rudimentary motoring skills. Sounds like a shrew, I know! But trust me, the rules have mellowed quite a lot since I spent some time behind the wheels. I used to get so exasperated. The traffic in Gurgaon frequently makes me think of an unrehearsed sports day – a day when everyone’s out on the roads with their props (read cars) with no coordination whatsoever! It’s all about heaving, shoving, cursing, coaxing, honking,barking – ya, totally maddening! But thanks to the dedicated efforts of Kush Bhaiya and Luv Bhaiya (for accompanying me on those early morning lessons), Shelly Bhabhi (for being my learning partner), my papa (well, for many things but a huge one for passing the driving gene along! 😛 ), Gunjan (for dragging me in the most awful of traffic conditions so that I had no other go than to find a way out 😛 ) and to my ‘driver saheb’ (for his patience and very handy tips, like- just ignore the honking lot! 😀 ), I can proudly say that I find myself quite useful these days!! 🙂 And what a liberating experience it is!! Yep, that’s about it for now! I know I’ve been away for quite a while (again) but trust me, really been caught up in quite a mess. Talk about one’s plate being full! Here my plate’s disgustingly over-piled and yet it’s getting ladleful of servings from every quarter. And believe me, very few of these servings are palatable! As for the rest, I just have to shove them down my throat. No other go! And it isn’t just me. Similar is the case with many of my friends. We say this so often — that one feels that he/she is being pulled in every direction, all at the same time, with forces of comparable magnitude. And we all know how that feels! Not good! But that isn’t the real point of this post. I intended it to have some spiritual merit too. Sometimes consciously, sometimes not so, I say my school prayer quite frequently and it does a lot to restore some degree of sanity and quietude to my often toppled life. Not to mention, it takes me back to those amazingly sweet and simple school days, which are so fondly remembered by all of us. It’s been eight years since I passed out from St. Joseph’s Convent High School (S.J.C.) and that would mean that I learnt this prayer some 18 years back! WOW. In S.J.C., classes one to five comprised the Junior Side while classes six to twelve comprised the Senior Side. There were separate assembly grounds for these two sections. When I think about it now, it appears to me that the time that these two groups devoted to the daily prayer was sort of a heads up to the continual shortage of time that seems to be the norm these days. OK. Allow me to put that a bit more plainly. As tiny tots, we would follow all the instructions to the tee – join our hands, close our eyes and recite the prayer very slowly and clearly, in a singsong manner. Listening to that recitation, you would have been sure that the kind Father was lending a patient ear to the cute prayers of these pure-hearted children. In the senior side, all of us (though no less devout) would be in a frenzy to complete the prayer. We would all rush through the familiar lines like crazy, as if it were a verbal race of some kind. And before God could have turned His attention to this hastily delivered chant, we would already be wishing Good Morning to our teachers! I bet you wouldn’t have caught more than ten to fifteen words from that hustled buzz if you didn’t know it beforehand. Well, just a few proud hands shot up. Most of the girls would smile sheepishly and avoid the faculties’ eyes. On those days, a very guilt-ridden and earnest group of girls would repeat the prayer, enunciating each and every word, reciting the lines flawlessly. Through this simple post, I wanted to share some of these fond memories. But more importantly, I intended to share my School Prayer here. I’ve been saying this prayer for my loved ones and myself for so many years now and it always makes me feel that God does carry us in His arms during the difficult times and brings us ashore, no matter what! These lines, whether recited hurriedly, chimed devoutly, muttered nervously or petitioned wordlessly, have been my ready made supplication to God for anything and everything! There are things we never forget and then there are things that we never wanna forget. This prayer is one of the things none of the Josephites would ever want to forget – not a word! I’m sharing it here with the hope that it’ll help you stay connected with God and soothe your frayed nerves during troubled times! And congratulations to us all for making it through yet another Doomsday prophecy! Writing this post because I’m ginormously glad to still be around — what with those in the know (or rather, those claiming to be in the know!) predicting the end of the world – left, right and centre! Wasn’t the beginning to the end supposed to begin last Saturday?? Yeah, the schedule chalked out by some moronic creatures (oops, preachers!) did list May 21, 2011 as The Rapture Day. Praise the Lord for ignoring all this morology and letting us live! I mean, the state of affairs might not be super ideal, weight loss pills might not be as effective (or at all effective) as they ought to be, a sane and sound system might still be a distant dream and the whole world, in general, might seem to be a shambles. Yet, whatever it is, am I not delighted to fret over these things instead of groping my way through some mystic tunnel or gliding ethereally or…er..Well, I’m not so sure about what people exactly do en route to the Pearly Gates! You see, it never does to tempt Providence, and so brazenly, at that. We keep cancelling bulk orders ever so often. It’s just not right. We might be asking for big trouble because we never know just when our luck will run out! Yes, I have always maintained that it’s just too risky to rub Mr. Yamraj the wrong way! Why meddle with things so totally out of our scope? Why not be contended with butting into the affairs of the lesser mortals?? I mean, there has to be a stop! First of all, we come up with this rotten idea of mischief – whereby anyone and everyone is so eager to share their two pennyworth (and much more) on the impending doom. Then, this freaking bit of an idea snowballs into this raging madness. And then, people are making money (via movies and documentaries and books) out of this whole business! Talk about being an opportunist! OK, just picture this for a sec! What if the merciful Lord’s still willing to put up with our lot for a millennium or two but on witnessing the ongoing hype about an impending apocalypse, He reviews His original decision! What if He gets so convinced about the futility of our damned race that He decides to toss an apocalypse our way?? Then what?? All that ill-gotten money won’t buy you the Noah’s Ark to row to safety! Yeah, so the point being — go find something else to thrill yourselves with and leave the doom alone. A little knowledge (and a truckload of stupidity) really is a dangerous thing! A Night to Remember – 2nd April, 2011! The whole affair has been extensively covered by the media, in every possible way! So, obviously, you won’t find any novel piece of information here…Just a few pithy proverbs to sum it all up! Just wanted to post something about our super-awesome cricket team…so that many years down the line, I can read this post and relive some of the moments that are so, so hard to come by! Winners make it happen, losers let it happen! 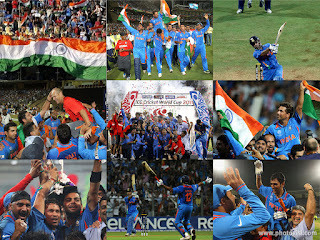 World Cup, 2011: Some people dream of success while others wake up and achieve it! Indian Team:- Putting your best foot forward! Batting:- The whole is greater than the sum of its parts! Bowling:- A problem shared is a problem halved! Fielding:- Many hands make light work! Gary Kirsten:- He doesn’t boast who does the most! Sachin Tendulkar:- Ability can take you to the top, but it takes character to keep you there! / Nothing succeeds like success! MS Dhoni:- Nothing ventured. nothing gained! / There’s a method in his madness! Virendra Sehwag:- Well begun is half done! Harbhajan Singn:- Prior preparation prevents poor performance! Munaf Patel:- All’s well that ends well! Suresh Raina:- Mighty oaks from little acorns grow! Virat Kohli:- It is through the small things we do that we learn, not the big things! Ashwin:- The key to all action lies in belief! Gautam Gambhir:- In the middle of difficulty lies opportunity! Ashish Nehra:- Some days you get the bear, other days the bear gets you! Piyush Chawla:- If you’re not part of the solution, you’re part of the problem! Yusuf Pathan:- All sizzle and no steak! Sreesanth:- There’s none so deaf as those who will not hear!